This holiday season, you don’t need to shell out huge amount of money for the foods you will serve and eat. There are lots budget friendly recipes in here that you can try at your own kitchen. This dessert recipe is shared to us by our friend at Sibuyas Republic. It’s one of its kind simply because, it’s an elegant dessert that is very budget friendly and it will come out in a jar too! This is a perfect gift for the holiday season too! Please note, this recipe is only for this single jar. 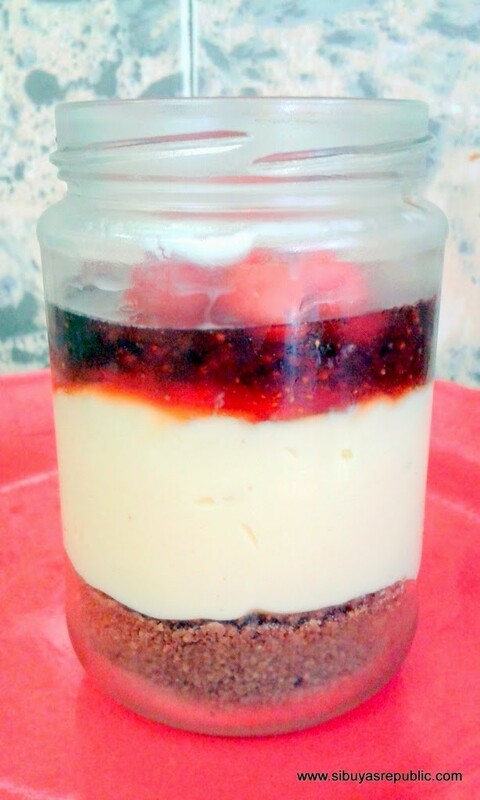 Add more ingredients if you are planning to do more cheesecake jars. 1). Melt butter. Add 1 pinch orange zest (optional). 2). Add the crushed Grahams. The reason I omitted sugar for the crust recipe is because the crackers in itself contains sugar. Also, cheesecake filling I’m gonna do is sweet enough. 3). Combine well and press the crumbs into the jar and place in freezer while doing the rest of the ingredients. 1). Using a mixer, beat on medium speed the cream cheese for 2 minutes. 2). Add in the condensed milk, orange juice and vanilla. Beat just until fully incorporated. 3). Pour this cream cheese mixture onto the jar with crushed Grahams. Chill for 15 minutes.